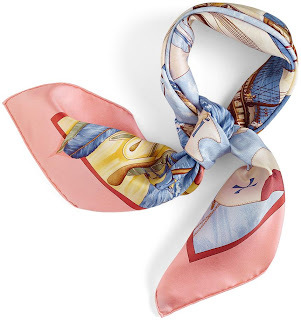 Today's post features a creation released as part of the Fall/Winter 2009 collection entitled "Hermes en Voyage". 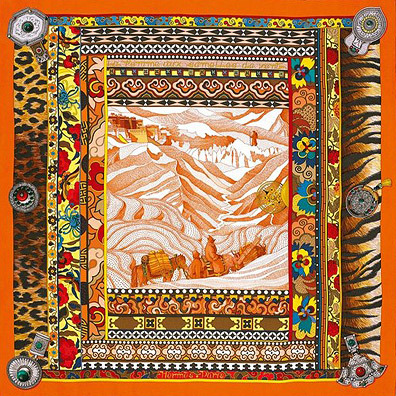 The scarf design was inspired by the style of Dang Ye, a Chinese painting artist whose creations, exposed at the 2006 Shanghai Art Expo, captured Pierre-Alexis Dumas' attention and interest (Hermes' co-artistic director). 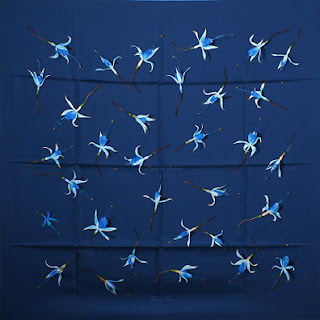 He recognized not only that his designs would make great scarf designs, but also that they encapsulate the "rhythms of China", particularly in this design. The design depicts a flag-like pattern that gives a sense of motion despite the apparent geometry, thanks to the unevenness and remote randomness of the rows. The vibrant colours - crimson, fuchsia, lilac, purple - instill a fluidity into the pattern and the scarf, inviting the admirer to fondle it. The scarf also ties beautifully. My appreciation for this scarf stems from my own experiences with the paintings of the late Romanian artist Gheorghe Pantelie. 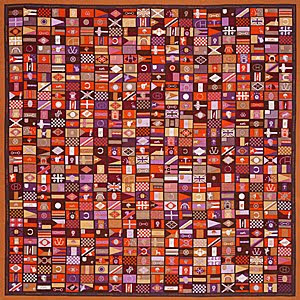 He was instilling dynamism into his creations by using a similar technique of drawing geometric patterns "in motion". 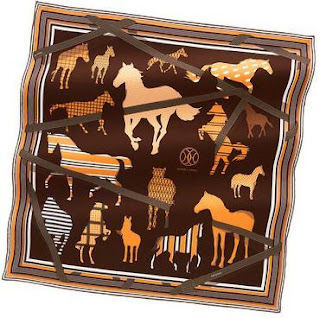 Hermes' first self-described "scarf for men", this "carre" (the French for "scarf", literally meaning "square") features horses - a theme so close to Hermès, as it retraces its origins - in motion. The designs depicts horse shapes in unconventional colours and patterns, suggesting different fabrics - which adds texture and diversity to the design and conveniently makes it more versatile to match one's outfits as one would have a greater palette of colours to wear. 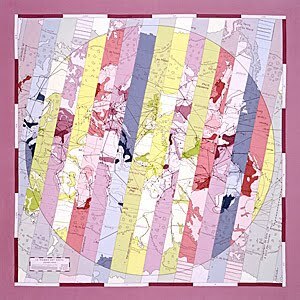 The size is 70cm x 70cm (the so-called "vintage-style" collection) and all scarves sport subdued colours. I'd be interested to see one and evaluate how the pattern displays when knotted. Particularly interesting I found the House's "pricing strategy", this scarf being "valued" at $275 rather than $295 for the ladies-inspired vintage-style carres. 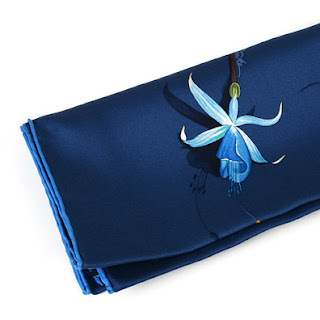 I came along this scarf, along with the previous one, by mere coincidence, while browsing a catalogue in a boutique. My fortunate find ! The background colour, described as "deep petrol blue", is equally rich and intense, although much less subdued than the previous, brick red one. The fuchsia flowers appear equally delicate, too, and seem ready for someone to pick them up. Lovely ! The author is Leigh P. Cooke and the title is "Fleurs de fuchsia". Enchanting ! The design of this scarf didn't really capture my interest until I discovered, thanks to a friend, the story behind it: it depicts a scene from Alexandra David-Neel's travel to Lhasa, the Tibetan capital "hidden" on a plateau up in the Himalayas and forbidden to foreigners. The story goes that while living in Japan, our hero (a Belgian-French explorer, spiritualist and Buddhist) she met someone who, disguised as a Chinese doctor, had visited the Tibetans in their capital city in 1901. Emboldened by both curiosity and her spirit of adventure, Alexandra put her courage to the test in 1924 by endeavouring to reach Lhasa herself disguised as a pilgrim - a feat embraced by the world media immediately, which sealed her reputation as a true pioneer. "La femme aux semelles de vent" ("the woman with wind as her soles") pays tribute to the legendary heroes who brought the world closer to us - who, in fact, helped us open up to the world. The reason why I stated that this scarf failed to captivate my attention is because of the very busy patterns employed around the edges, edges that prove rather "thick" relative to the focal scene. Encassing the scene with a heavy border - the same pattern along the edges - gives the impression that we look at the travelers - Alexandra and her companion - through a window. Indeed, this window into Alexandra's experiences provides, like a window into her soul, glimpses of the hardship and obstacles she confronted along the way, and, indeed, the achievements at the end of her voyage of discovery. A monochromatic scard is perhaps better alternative to the very busy, bordering on ostentatious display, that brighter colours give. Many years ago, almost to the day, I crossed the Atlantic myself in search of adventures that even my rich imagination could not envision, so it's appropriate that I mark the event with a tribute to another explorer, Christopher Columbus. 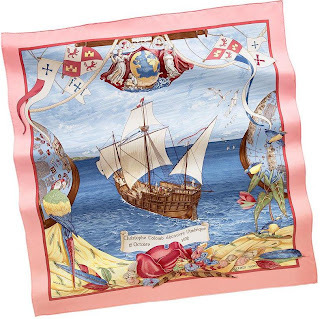 This is a 2009 reissue of a 1992 original, equally as impactful as the first time it was released: "Chritophe Colombe" is a tribute to the Spanish explorer and navigator whose carrack Santa Maria is prominently displayed as the focal point of the scarf, while two semi-globes, suggestive of the revolutionary thought that the Earth is round, frame the middle picture on two sides. The lower part of the design depicts the navigator's hat while a banner above reads "Christopher Columbus discovers America, 12 October 1942" (the date recorded by the explorer of the first sight of land - at 2am - by a sailor aboard the Pinta, one of the two other caravels that formed the expeditionary vessels; this territory, part of modern day's The Bahamas, was named San Salvador). The banners at the top give the image a celebratory tone, which exudes energy and instills life into the admirer. While the pattern is pretty busy, the scarf displays wonderfully thanks to its multitude of pastel colours that make up the design, and the light elements of flags and feathers incorporated into the design and appearing when the scarf is knotted. An interesting design of the Fall/Winter 2009 collection, "Le monde est vaste" ("the world is vast") plays on the world map by dividing the picture into stripes and interchanging them so as to create a sense of motion, or perhaps adventure. The idea behind this design is to have a tool that helps you get lost into the world, rather than find your way. A sure element of appeal to those romantic dreamers among us. A very creative design, which looks great when worn. This particular colour combination is also mesmerizing !